Green & Elliott Optometrists have been established for more than twenty-five years. The Practice provides eye examinations and sight tests using the latest in ophthalmic technology. We offer a full range of dispensing services including fashion frames and up to date lenses, all at affordable prices. 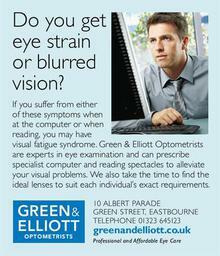 The Practice is an independent partnership with four locations in Sussex. Our experienced practitioners are qualified to advise on all aspects of vision care including management of eye conditions, specialised computer spectacles, general purpose multifocals and contact lenses.